Lucky relaxing by the candle light... Rest in peace my sweet boy. We ended up making a bed on the floor and sleeping with the dogs next to the candles and lit up Christmas tree...complete with Christmas music of course. I am so glad I took in every moment from that night cuddling together! Matt and I gave each other bikes so we could exercise together and take Lucky out for faster runs. 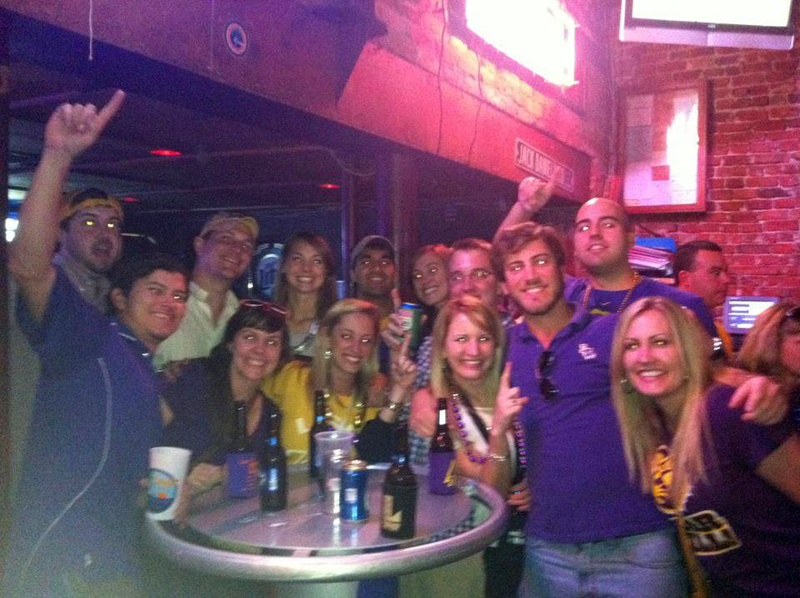 We didn't have his yet that night because we weren't sure about his national championship ticket, so I gave him an LSU flag as a filler gift. The dog's were so interested in it. I love when dogs are just plain goofy. Bijou likes to prop her head up by wedging it between the couch cushions to watch us in the kitchen, then she fell asleep with her head between the couch cushions and her mouth smashed against the back of the couch...I died of laughter! I gave all the Tags stockings with small gifts for Christmas. It is a tradition that my family has always done, and they had NEVER done it so I thought it would be fun. Matt's sister, Layla wanted to try and buy all her gifts locally so she got both of us t-shirts from a local shop (Matt's is above) called Parish Ink. The funny think is that I was eyeing an LSU inspired "Roar Y'all" shirt from there online and when I opened the box, there it was...she had no idea I wanted it...love that store! The Tag fam...minus David...he was making money off the coast of California on a ship! Bijou ate most of his stocking stuffers after we got home; I guess she thought they were for her. We just stayed home and relaxed for New Years because we knew the next weekend would get a little crazy. The National Championship weekend in NOLA might as well have been a holiday, and I had a marvelous time...well except for our little loss. Sixteen of us headed to New Orleans to spend 3 nights together in a 3 bedroom condo. The air mattress was one of the best purchases we have ever made haha. Sometimes it is nice to get away with great friends, make great memories, and not worry about all of the details. 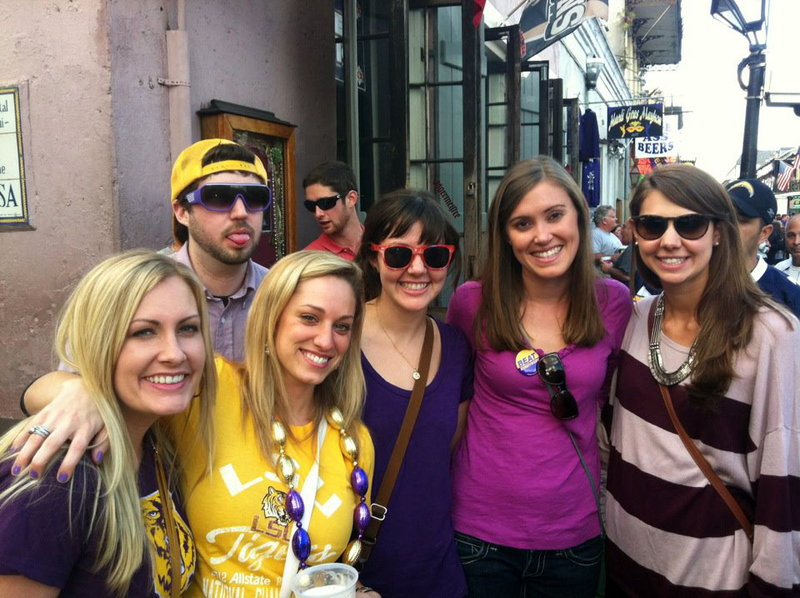 We headed down with the car LSU'ed out and in a hurry to get there in time to try and get tickets to the Saints game. Once we got there I got ready in the car (oh the things we do for football) and we sped down to the super dome...past crowds and jazz bands...to look for tickets from a legit scalper. We got 2 tickets in the club level and headed to the dome. My first priority was to watch my Saints play...Graham and of course Brees are my favorite players. If you haven't read about Graham's life you should...very inspirational and I love his determination. I think Matt is a little jealous of my love for him ;). Luckily, they are both on offense (at least one team had an offense that weekend) so when defense came on I was able to turn around and look at a few more familiar faces...Brett Favre, Vince Vaughn, Ron Livingston, and Kenny Chesney were two rows behind us in a suite. We snuck a couple pics. We met up with Ashtyn and Derrick and headed to Pat O's for a few hurricanes to cap off the night. The piano bar is so much fun! A late night= a late morning so we took it easy the next day and just hung out with the group. That night we had no clue what to do and really didn't want to go to Bourbon, then we got a call to go to the W Hotel for a free party, with free beer, and a free Pitbull concert. Too good to be true? That is what we thought, but we didn't have anything else we really wanted to do....and what do you know, two nights of awesomeness for me! Apparently they had wanted to keep it a secret for their patrons, but then no one showed up so they got desperate...sure we will help you out. Only a couple hundred were there in a small New Orleans courtyard. All of the best latin sounding club music being played and dancing like crazy...my kinda night. I couldn't even drink the free beer, but by the end of the concert we were all soaked from dancing so much. I think what made that night so great was that we had very low expectations haha. The next day we were ready. We paced ourselves so we could be in full swing for the big game. Luckily, we could not find tickets cheaper than $1,000 so we decided to watch the game in a bar (best money ever saved...maybe that was the lucky part of that night). Unfortunately, the team we had been rooting for all season decided not to show and our coaches decided to give up on them. To me it was not that we lost, but the we never even got started. There was nothing to cheer for that night, so I decided it was best for us to head back to the condo and hang out together. MOST of the group thought that was a good idea...there was just too much red out there acting up (and btw they are brutal...I think a little more than LSU if that is possible) and I wasn't sure I wouldn't get a tude with them. Being together helped and by the end of the night we were all laughing about the game. LSU had a heck of a season...even though they scored no points in the game, the season might still be the best in the school's history and we did beat everyone we played...just not twice! ;) Good thing the game was at night so we could enjoy our day. When we woke I hoped it was a bad dream, but it wasn't. It had rained early that morning...washing the crimson away and everything (including the sky) just looked gloomy and sad. We wanted to end our trip on a good note so we hit up Brennan's for their famous breakfast and treated ourselves to banana's foster (invented there)...and as you would expect, boot camp has been HARD! view from our condo rooftop...one street off of bourbon. Happy 2012 again! Hope it has been a great year so far. I KNOW it will be and I promise I will post shorter blogs...maybe!